mundane jane: As far as the eye can see. 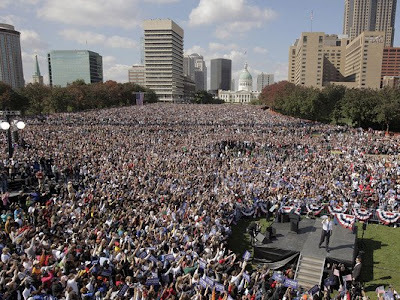 100,000 people gathered together in Missouri today to see and hear Barack Obama. Wow. On a clear day, you really can see forever. Wow. Let's hope they all get out there and vote. I got sorta teary-eyed looking at pictures of the St. Louis and Kansas City rallies. They really reminded me of pictures of Martin Luther King, Jr. addressing crowds. I'm all caught up in the Hope-i-ness of it all. Yes We Can!